BREAKING NEWS! New Original Trilogy Shorts Coming! Wow! Check it out! Disney is finally strumming the heartstrings of OT fans! 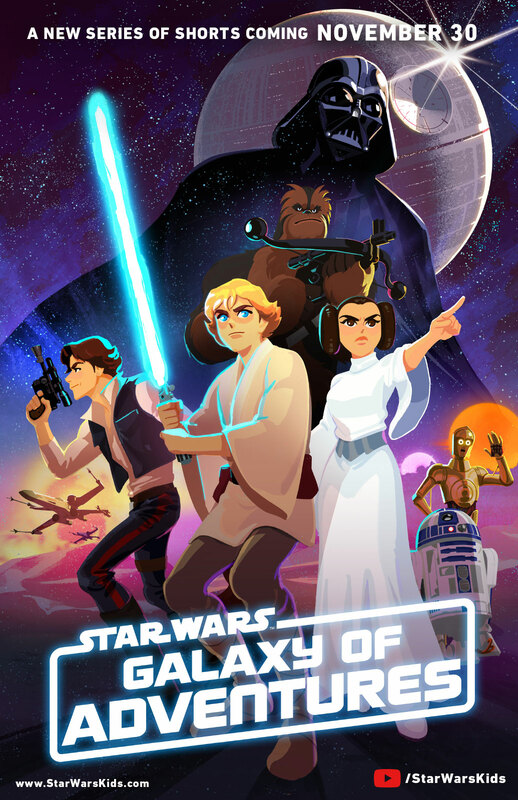 A new series of animated shorts [mostly] based on the Original Trilogy is coming called Star Wars: Galaxy Of Adventures! Check out the trailer! Special thanks to all who wrote in to let us know! UPDATE: Official press release and poster added. Click through for details! Making their debut on November 30th on the newly created Star Wars Kids Website (www.StarWarsKids.com) and Star Wars Kids YouTube channel, the first 6 exciting shorts will be accompanied by fun mixed media educational pieces designed to help older fans, parents and other mentors welcome the kids in their lives to explore a galaxy far, far away. Additional shorts featuring fan-favorite characters will debut in December and then on a weekly basis starting in 2019. The adventure continues across a variety of product and platform categories including a new line of Hasbro toys available on December 1st exclusively at Walmart and then nationwide in January 2019. Lucasfilm, the Lucasfilm logo, STAR WARS, and related properties are trademarks and/or copyrights, in the United States and other countries, of Lucasfilm Ltd. and/or its affiliates. © & TM Lucasfilm Ltd.
Next Article: Grab TBS6 [P3] Han Solo (Bespin) Before They're Gone At EE!